Adapted AquaticsAdapted Aquatics is a program designed for children and adults with neurological, developmental and cognitive challenges. This program is a great introduction to the water and its benefits. Participants are introduced to the water gradually through instructor assisted open swim and then transitioned into instructor led activities in a quiet setting that will enable them to focus. Our pool will be heated consistently to 83-85 degrees.During this 25-minute block of time, individuals can enter the water with a family member, or alone, at their own pace. Professional lifeguards will maintain vigilance during the program and multiple Swim Instructors will be in the water the entire time to assist with open swim and teach lessons. 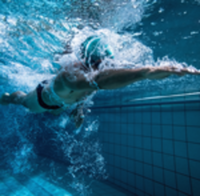 If a lesson is not appropriate or wanted at the time, the individual can choose to move/exercise in the water as they please.Please note our Aquatic Staff are skilled in aquatic instruction but are not therapists. Aquatic staff will solicit input from parents and other family members that could aid in the learning process and allow our staff to efficiently and effectively tailor the lesson to each individual's needs.Goals of the Adapted Aquatics program include:Providing opportunities for continued social interaction with family, friends and instructorsProviding individuals with and aquatic environment with unique physical properties which can enhance motor learning for people with disabilitiesBuilding strength, increasing cardiovascular endurance and improving motor skillsProviding a sense of freedom to individuals who require physical assistance through water therapy, while encouraging them to engage in physical challengesFor safety purposes, we ask that individuals who are known to have seizures wear a red bathing cap. All persons who are incontinent or not toilet trained must be in swim diapers before entering the pool.